You are currently browsing articles tagged Bucklebury. New Tours and Collections on Historypin! As you will have read from Greta’s post Crowdsourcing with the Bucklebury History Group, we’ve been doing a lot of work over the past couple of weeks on our MERL Historypin channel. 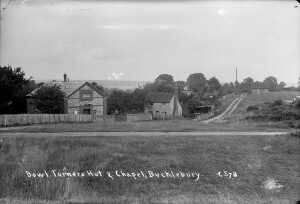 A large number of the Collier photographs of Bucklebury have been re-pinned to more precise locations, and some of them are even pinned to street-view, where possible. The next stage for us was to start to make proper use of some of the other features of Historypin, so Danielle and I spent an afternoon this week experimenting with ‘Tours’ and ‘Collections’. 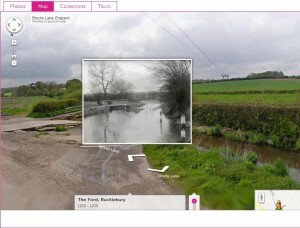 A Collier photograph of Bucklebury ford, recently re-pinned to street-view. Tours and Collections are essentially features that enable users to group together and highlight particular sets of ‘pins’, according to whatever theme they choose. The Collections feature is particularly suited to grouping pins by theme. A Collection could be created to show a set of photographs taken by a particular photographer, or a set of similar objects. The user can add some introductory text to explain the rationale of the collection and any other information they want to include. 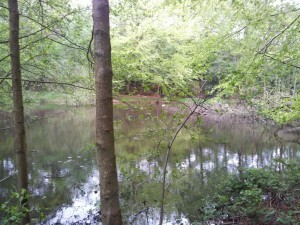 The selected pins can then be viewed either in list-form or as a slideshow. 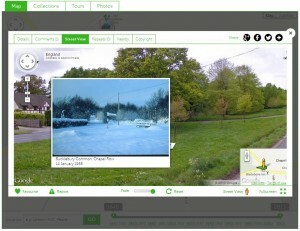 The ‘Tour’ feature initially appears to be similar, but its potential lies in the use of pins that are pinned to street-view. Where relevant, the pins appear in the slideshow automatically in street-view, with a small map showing their location and a small space for extra text to its left. 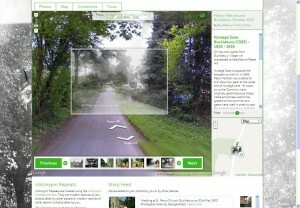 If all the pins are on street-view, then, a tour can enable the user to virtually ‘walk’ down a street, fading pins in and out of view and following their progress on a map. Describing the features doesn’t quite convey their potential to enhance a Historypin channel, so the best thing to do would be to take a look at some of the tours and collections Danielle and I created this week, on the MERL and Bucklebury History Group channels. Simply go to the channels and select the ‘Collections’ or ‘Tours’ tabs. 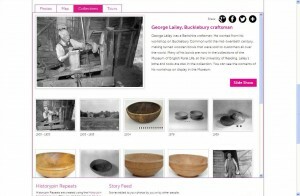 The ‘George Lailey, Bucklebury Craftsman’ collection, on the MERL Historypin channel. The ‘History Walk around Bucklebury’ tour on the Bucklebury History Group channel is a particularly good example of what these features can do. You’ll see that the tour includes photographs and objects pinned by MERL as well as those pinned by the History Group. In this way, users are not confined to their own content, but can make use of any photographs and objects pinned on the website. 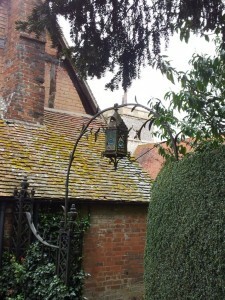 A Collier photograph of Bucklebury pinned to street-view, as seen in the ‘Bucklebury History Walk’ tour. And there are a lot of pins to choose from. According to the counter on the homepage, there are, to date, over 210,000 pins and comments on Historypin, and this can sometimes make the website (and individual channels) a victim of its own success. The more that is pinned the better, but this makes it harder to sift through the content to find particular images. 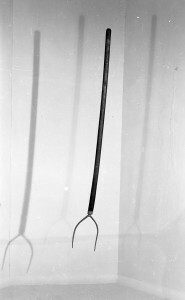 If you look at the main list of pins on the MERL channel, for example, you will have to trawl through a lot of pages of object pins before you reach the Collier photo pins, which were added at an earlier date. A major benefit of the tours and collections features is that they provide solutions to this problem. They can highlight particular sub-sets of pins and make it much easier for their users to find what they might be looking for. We think they also make the channel more interactive, informative and enjoyable to browse. We’ve gone a bit quiet over recent months on the progress of our work with Historypin, so I thought it was perhaps time for an update on what we’ve been doing behind the scenes. If you go to the MERL Historypin channel you will be able to see some of the first objects we have pinned to the map. Most of these are from the Berkshire village of Bucklebury, but there are also some wagons and ploughs from a wider geographic area. Inevitably, these first trial uploads have thrown up some technical issues that we hadn’t considered. When we export data from our own Adlib database, we want to minimise the alterations made to that data before it is then uploaded to Historypin. The fewer changes we make in that intermediate stage, the more manageable and future proof the whole process becomes. Initially, we had exported our data into a CSV file (it stands for ‘comma separated values’, apparently). When we looked at the resulting pins on Historypin, we realised the limitations of this approach. Whilst most of our objects have only one known ‘place made’, ‘place used’ or ‘place acquired’ (if at all), there are some objects for which we have more complete object biographies, where we know perhaps two or three previous owners. Similarly, there might be a composite object, with multiple parts made by different people. This fork (60/290) was made in multiple places. Its handle was made by Bucklebury handle-maker Harry Wells, whilst the metal head was made by a local blacksmith. Because of the way they work (something to do with being ‘comma separated values’) CSV files can only export one occurrence of each database field. We had to find a new method of exporting which would enable us to pin objects to all the places with which they are associated. We are currently trialling the use of XML files as an alternative. We’ve yet to try uploading to Historypin in this way, but our first tests show that we can at least export multiple occurrences using this type of file. So, we’re making progress. Another problem we’ve been working through is trying to find a way to export latitude and longitude data for associated places. Focussing on place has already necessitated the addition of extra fields to the database – initially we recorded latitude and longitude in the notes field of the thesaurus records, but specific fields for grid references have since been added, and we now record the information there. Due to the way the database works, though, we were initially unable to export the latitude and longitude for places added as ‘associated places’ (rather than as a ‘place made’, ‘place used’ or ‘place acquired’). This problem has since been solved by extra changes to the databases, but it highlights how projects working with technology such as this require a significant amount of technical work behind the scenes to get museum data online. It is not always just a case of looking at the accession files and then bunging it all on a computer. As we’re approaching the end of the week, and I’m trying to stop myself from getting distracted by news of all the Olympic medals that are being won today, I think it’s probably time for another short blog post to update you on one of the things I’ve been working on over the past couple of weeks. We’ve currently got an intern working with us on Wednesday afternoons, George, who is helping us with some new object photography. 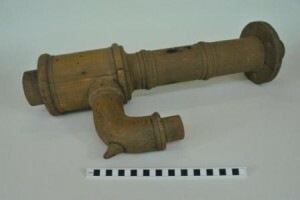 We’ve talked in some previous posts about our work with Historypin, and this object photography is a part of that. Every object we pin to the Historypin map needs to have a photograph, and we’ve started by making sure that we have one for each of the roughly 300 objects we have from Bucklebury in the collection. 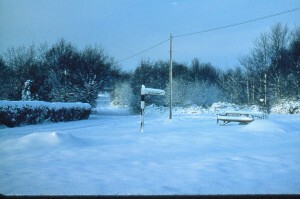 We already have some digital photographs, and we are filling in many of the gaps by scanning old photographic negatives. We’re now in the process of taking new photographs of the 55 remaining objects for which we currently have no photograph or negative. 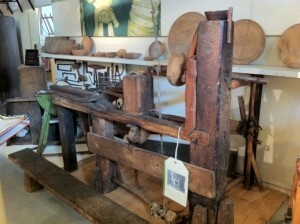 2006/47/5, a wooden pattern from Bucklebury Foundry. 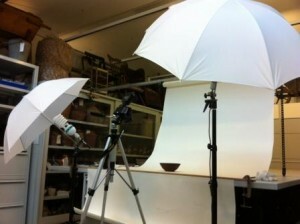 To start with, we have focused on photographing the objects which are easily accessible on the mezzanine object store. With a lot of help from MERL’s Conservator, Fred, who set up a rather snazzy mini-studio for us, we’ve taken photographs of roughly 50 objects from Bucklebury. Largely, this set of objects consists of wooden patterns from Hedges Foundry and some wooden bowls turned by George Lailey. Next on the ‘to-do’ list are the remaining Bucklebury objects which are on display, and shortly we will also start photographing some of the objects donated to the Museum in the early 1950s with another intern, Matthew, who will be helping from tomorrow. 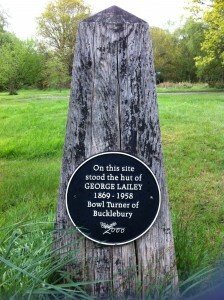 One of the top spots on our guided tour of Bucklebury earlier this week was Turner’s Green where George Lailey, widely known as the last traditional pole-lathe bowl turner in the country, had his workshop. George Lailey was born in 1869 and died in 1958, aged 89, and both his father and grandfather were bowl turners. Lailey never married and had no children so had no one to pass his skills on to. By the 1930s Lailey was very well known and was signing his bowls, supplying bowls to Harrods, and receiving visitors to his workshop. The commemorative plaque on Turners Greener in Bucklebury. 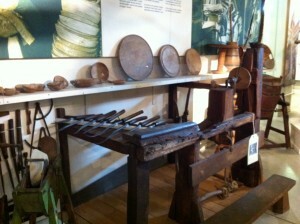 After Lailey’s death, MERL acquired the contents of his workshop, including his lathe, tools, and bowls, and has continued to acquire Lailey bowls over the years. The foot-powered lathe is a must-see for woodworkers. Robin Wood built a replica of Lailey’s lathe and has helped to revive Lailey’s techniques, assisting in the reintroduction of bowl turning to numerous countries across the globe. Today we had a visit from bowl turner Jamie Carr, who is demonstrating this week at Oxfordshire Art Weeks. Lailey was particularly skilled at ‘nested’ bowls, in which several bowls of decreasing size are made from the centre of the previous bowl and this requires specialist tools. Jamie was keen to have a close look at Lailey’s tools so that he can make his own. I think we both learned a lot from the visit. I certainly learnt a lot from Jamie about all sorts of things pole-lathe related – from explanations of how the tools were used to how the wood was worked – and took plenty of notes. It makes such a difference when cataloguing objects and writing object descriptions if you really understand how something was used and why, so these sorts of visits are a big help to us too! It was also my first time supervising a visiting researcher alone – I think it went quite well! Things have come a long way since my first blog post back in February about what we do in our work at MERL. No longer do we spend our days solidly cataloguing! In fact, it sometimes feels that a week goes by with hardly any cataloguing at all. So I thought I’d write a bit about some of the other things that we’ve been doing. We’re working on a joint digitisation project with University College London, funded by the Joint Information Systems Committee (JISC), as part of Object Based Learning 4 Higher Education (OBL4HE). We’re digitising two things – 60mm negatives of objects in the collection, and documentation relating to 150 selected objects. This involves scanning and some basic editing in Photoshop. Our target is to digitise about 3500 negatives, and we’ve already done 3150, but we’re hoping to carry on and see how far we get – there are 23 boxes of these negatives in the archives, and we’re only on Number 7! We have a wonderful team of volunteers who have done most of the work on the negatives – Felicity and I only spend two or three hours each a week on it. If you’d like to get involved, take a look at our Volunteering page. Felicity and I started scanning the documentation last week and have already scanned 370 documents for 47 objects (there’s often a big chunk of letters and forms in each object file). Have a look at the OBL4HE blog to find out more about. Me posing for my scanning negatives shot. It's actually quite a relaxing task. MERL offers guided tours to visitors on Wednesday afternoons and weekends, so we’ve taken up the opportunity to be trained as tour guides. As well as practising the general museum tour we’ve also developed a project-focussed ‘Sense of Place’ tour which draws out connections between the displays and the work that we’re doing. We’ve already given our tour twice, but still need a bit more practise. Felicity posing for her tour guide training shot. 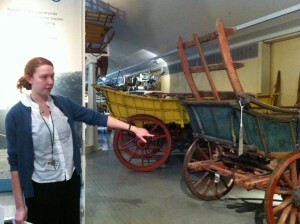 Here she's highlighting the regional differences in wagon design. 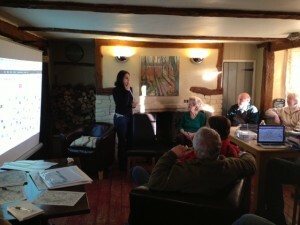 As mentioned in earlier posts, we’re working with the Bucklebury History Group on various aspects of the project. Danielle has been enhancing the catalogue records for objects from Bucklebury, concentrating at the moment on the Wells Collection. 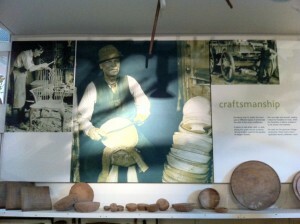 Harry Wells was a handle maker working in Bucklebury for about forty years until 1950, and we have lots of his tools. I’ve been scanning the Collier Collection of glass plate negatives of Bucklebury. Phillip Osborne Collier was a commercial photographer and postcard publisher working in Reading from 1905. We have around 6000 glass plate negatives of photographs he took in Berkshire, Hampshire and Oxfordshire. The Bucklebury photographs were taken 1905–1960s – they’re beautiful and we’re hoping that the members of the History Group can help us pinpoint more exactly where they were taken. The History Group visited MERL a couple of weeks ago and we’re off to Bucklebury tomorrow for a guided tour to help us get to grips with its geography – there’s Bucklebury, Upper Bucklebury, Bucklebury Common, Chapel Row, The Slade and numerous other places – and we need to understand how they fit together in order to catalogue them properly. Bucklebury History Group will be at the MERL Village Fete on Saturday 9 June, and Felicity, Danielle and I will be scanning photos of Bucklebury which could be uploaded to Historypin, so do bring any along if you have them. We’ll also be scanning your royal photographs to add to Historypin’s ‘Pinning the Queen’s History‘ page so bring those along too. 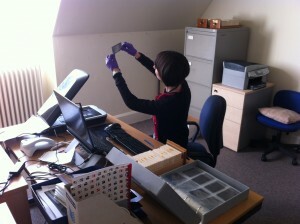 We’re also getting to have a go at other curatorial tasks. This includes editing label text for our new exhibition, Our Sporting Life, which runs until 16 September, responding to enquiries, looking into possible acquisitions for the Museum, and supervising visits from researchers and interested groups. Felicity has signed up for various technical training courses as she’s rapidly becoming our technical whizzkid. And finally, we are still doing a bit of cataloguing, although at a considerably reduced rate. Danielle is focussing on Bucklebury objects, Felicity is cataloguing objects from particular cases which can be linked to QR codes and I’m happily cataloguing baskets.